We’ve all been there. 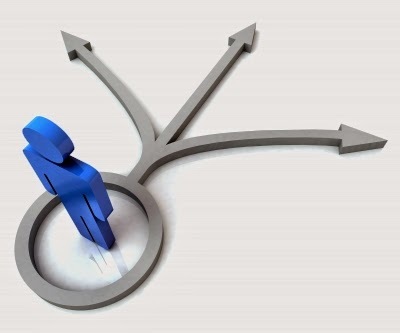 Stuck at the crossroads of an important decision and can’t seem to make a decision. We have considered everything worth considering and yet there we are, standing at the intersection of LEFT and RIGHT. Stuck in the paralysis of analysis…not moving backwards but not moving forward either. Should you take this apartment or that one? Take this job or that one? Date this person or that person? Eat at this restaurant or that one? Decisions! Decisions! Decisions! Sure some simple decisions don’t require a spreadsheet but some are pretty important. So why are some of our decisions so difficult? Why do we find ourselves in frustrating situations when we are making decisions about our lives and relationships? Well, here are a few reasons I have encountered in my own life and have helped many people resolve in my coaching sessions. These are not all conclusive but understanding these, and making adjustments where appropriate, might just make all the difference when it comes to making decisions on your life’s journey. This is one of the greatest and most popular mistakes that people make when it comes to making decisions. They start looking at the POSSIBILITIES before establishing the PURPOSE. Let’s look a bit more closely at that. So say you are trying to decide on a vehicle to purchase and you start to brainstorm on the possibilities. You quickly become overwhelmed by the gazillion possibilities. SUV, Minivan, coupe, or 4 door sedan. Japanese, German, or American? Hybrid or Regular? Blue, White, Green or Fuchsia? New, Used or Certified Preowned? That can get overwhelming very quickly. What if you did it the other way round? What if BEFORE you started looking at the possibilities, you started by defining the purpose first? What if you spend time to first establish the purpose that the car will serve? You establish the fact that that this is a vehicle that you will drive more than 15,000 highway miles a year, one that will double as a family car for your growing family when you are not on the business trips and one that can take all the equipment for each family member’s hobby. THEN…at the point when you have established purpose, you lift your head/mind to look for possibilities and you’ll see that the decision is much easier. Same thing with those “potential relationships”. Should I date this one or that one? Person A has attribute 1, 3, 6, 8 and 10 but person B has 1, 3, 4, 5, 7 and 9. You will confuse and frustrate yourself if you try to make decisions based on the possibilities in front of you without first establishing the purpose. What if you stopped looking at the options for a second and thought deeply about the PURPOSE that relationship will (or is meant to) serve in your life and you realize that attributes 1,3,7 and 9 are the most important for you to have…you would have just significantly reduced the difficulty of making that decision. Unless you can properly define the purpose behind a decision, you are not ready to make that decision. Reviews are great. I read reviews ALL the time but I know that they have their place. The problem arises when you over rely on reviews when trying to make a decision. The problem with reviews is that you are relying on people’s experiences with someone/something/somewhere in a context that may not be the same context that YOU will be engaging in. The problem is where you can’t make a decision until/unless it is a decision that the majority will make. I recently wanted to buy a presentation clicker as I am constantly in front of an audience presenting but as I scanned the reviews, I came across a couple of unhappy customers. On the surface, I would have simply decided not to buy the clicker. Looking deeper in, I realized that they were using the clicker for purposes different from my intended use. When you rely on reviews …reviews about things or people, be sure you don’t over rely on them and ensure that you are properly defining the context that you are looking to review in. Like someone renting a car for a day and it didn’t drive well so they wrote a review about it and you swear never to buy that kind of car—Not the way to utilize a review. 1) It is not always a deal breaker that some people express dissatisfaction with someone or something. WHY? Because people are more likely to express their dissatisfaction than their satisfaction anyway. Think about it. Think about the last time you had TERRIBLE service at a place of business or retailer. You were more likely to tell anyone that would listen, than when you had great service. We are more likely to share our negative experiences than our positive ones. So if your review has a few more bad ones than good ones, it may not necessarily be a deal breaker. 2) Look for consistency: The most reliable reviews are those that give a recurring trend…you know…where there is mention of a recurring theme/trend/issue whether good or bad. Reviews that are all over the place are not as useful because they are one off situations where people may have had bad experiences and interpreted it in a certain way. 3) Remember to consider timelines: Reviews that are old are almost useless. People, places, things, processes change…for the better or worse…but they can change. So that guy or girl that you knew in High School may be a completely different person today and that 2 year old review about that restaurant on B street is probably no longer accurate. Look for current reviews. 4) Remember to review the reviewer. Sure your best friend may the absolute best reviewer when it comes to shopping for handbags but is she the best for giving the last word about a potential man in your life? Sure your boy is great at giving financial reviews and advice but is he the best to talk to about raising kids? So sure…use reviews…”ask around” but make sure you are keeping reviews in its place. If you make it too important, you will be at the mercy of other people’s insatiable appetite. It’s good to have great goals. Goals that challenge you and stretch you outside of your normal comfort zone for achievement….but there is a fine line. There is a point where a goal that we unconsciously perceive as “impossible” will cause us to not even attempt. Sometimes in life, making a good decision (instead of a perfect decision) is better than not making a decision at all. So … eating in an “ok” (as opposed to eating at the absolute fanciest restaurant in your city) tonight might be better than not eating at all. Here is the other VERY subtle thing about decision making. Ready? Sometimes, people use the “desire to look for the best” as an excuse to not have to make a decision. So it’s not that the decision is really hard, it’s just that they are afraid to make one so they would rather wait for an unreachable BEST rather than decide on the reachable GOOD in front of them. That’s why people don’t start “good” things because they can’t get “perfect” right away. That’s why people won’t start that good business because it’s not world class yet. It’s the reason why people won’t be “friends” with someone because that person isn’t “marriage” material (More of that in “Don’t Prequalify your lead”). So make a move. Sure sometimes you should wait it out Sure you should always weigh your decisons…but many times in life you have to make the absolute best decision that you can make with the information/resources in front of you and leave space to forgive yourself if things don’t turn out perfectly. I am going to invade your personal space on this one…but you’ll thank me for it later. Most people I have coached on decision making all share this trait. They are so hard on themselves that they stay clear of tough decisions all together. When they make mistakes, they beat themselves up so hard that they never want to let themselves down ever again. One bad experience in that relationship/decision and they shut that part of themselves down. Unfortunately, the more you do this, the weaker your self-confidence, the weaker you look to yourself and to others and the less capable you are of taking advantage of unique opportunities that come your way (that may be outside of your comfort zone). The more that happens, the more your life tends to stay the same…average. The more this happens, the more risk averse you become but life….the extraordinary life you admire and aspire to have, takes some level of risk to reach and achieve. Failure can be devastating…I know. I have had my share of that…but I know the importance of maintaining the “desire to try again”. When you are so afraid of failure, when you can’t forgive yourself for making a mistake, your life clams up and that’s not good…because to live your best life, you must be OPEN.